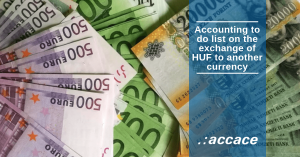 Find a short summary below on what to do when a business decides to conduct its books in another currency, instead of HUF. The first, and most important step to take, is that the company’s shareholders decide on the currency change with a shareholder resolution. The fact of the change of the currency than shall be registered by the Court of Registry and from that date on, the company may conduct its books in the currency chosen. According to the Section 145 (1) of the Accounting Act, an annual report or simplified annual report shall be prepared by the transition date, in the currency used before the change occurred. In this case, it is advisable to switch currency at the end of the financial year, thus the creation of a separate report is not necessary. It is important to point out that the pre-transition annual report are to be published according to the general rules (last day of the fifth month following the end of the financial year). The next step is to convert the data contained in the annual report or simplified annual report to the selected currency, and an annual report or simplified annual report, which contains the opening data, must be prepared in the selected currency. The opening annual report or simplified annual report in the chosen currency must be verified by the auditor, but does not have to be published. This annual report shall be the basic document for the opening ledger of the chosen currency.